I love it when you leave feedback for my recipes! Sometimes, you leave suggestions and shared your tweaked versions with me in the comment box. Sometimes, you ask me if I can vary the recipe into something else. Friends, this post is inspired by you. Ever since I have featured my olive oil shortcrust pastry, there has been a considerable interest on other ways of incorporating it into baked goods besides making a quiche. Those seemingly innocent 11-word-question from Carolyn has inspired me to making these Aussie meat pies with olive oil shortcrust pastry. 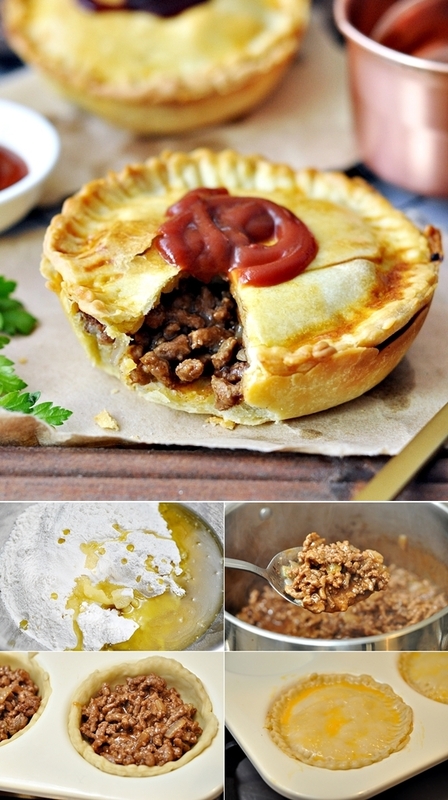 Plus, I am always up for some meat pies! So Carolyn, at this moment, my answer to you is YES! A big YES! I was very happy with how the meat pies turned out because people who can’t have dairy can still enjoy them with a no-butter shortcrust pastry. Here’s a thing or two about the meat filling – I used Fountain Good Choice Soy Sauce in an effort to add some depth to the flavour in the absence of beef stock. The rest of the ingredients are pretty standard like Fountain Good Choice Tomato Sauce and Barbecue Sauce, Worcestershire sauce, an onion, corn-starch and water. That’s pretty much it. It’s so easy I bet my husband could make it (shhh don’t tell him)! 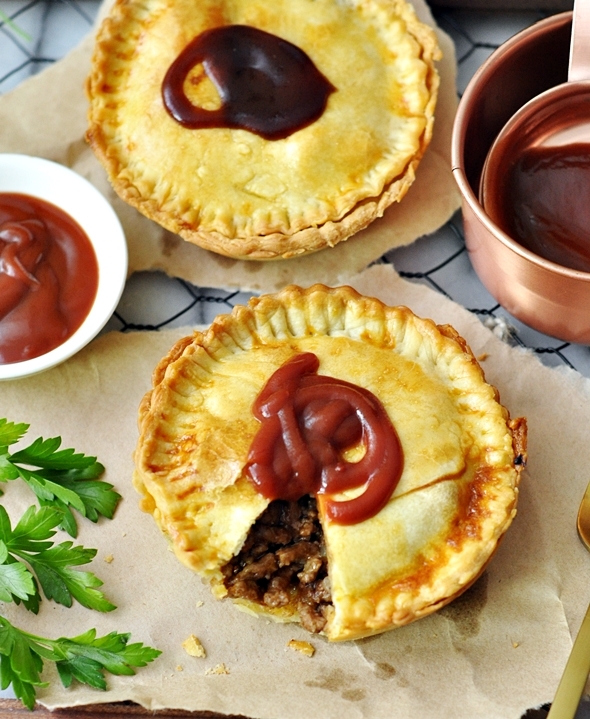 Come to think of it, aside from the minced beef and onion, the rest of the ingredients used to make these meat pies are likely already available in your pantry cabinets. In a mixing bowl, mix together flour and salt. Then add in olive oil using a fork until resembles breadcrumbs. Gradually stir in cold water (about 3/4 cup as a guide as it may vary) until the mixture forms a dough. Heat oil in a saucepan. When the oil is hot, add onion and saute until translucent. Add mince beef and brown it until fully cooked. In the meantime, mix cornflour and 3/4 cup water in a bowl and set aside. Add the cornflour mixture, tomato sauce, Worcestershire sauce and barbecue sauce and mix well with the mince beef. Allow the beef mixture to simmer over medium-low heat until the sauce is thickened. Season with soy sauce and allow the beef filling to cool. Preheat the oven to 190C/170C Fan/ 375F. Grease the pie pan (I use this pie pan) with some olive oil/cooking oil and set aside. Roll to flatten the dough to about 3mm in thickness. Cut 6 x 13cm circles from the shortcrust pastry. Use to line bases and sides of the pans. Spoon with mince. Brush rims with water. Roll and flatten the remaining dough and cut 6 x 13cm circles from the shortcrust pastry and place over meat. Press to seal with a fork. Trim and brush with beaten egg. Bake in the preheated oven for 20 to 25 minutes until the top of the pies appear golden brown. Note – the filling recipe was tweaked from www.taste.com.au. This looks incredible, and I particularly love that it’s dairy free! Is it fine if I omit the barbecue sauce? 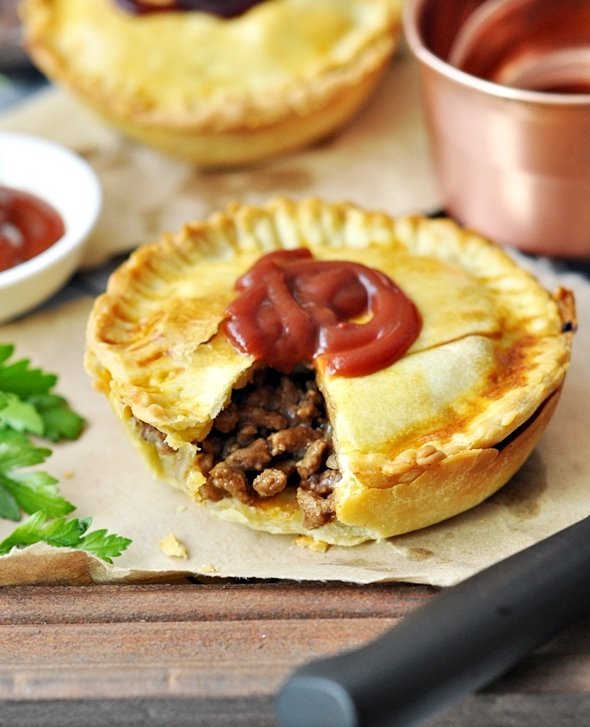 Nothing beats a good Aussie Pie! I love that you have made an olive oil pastry – you definitely have got me craving one of these right now.